Q: What does Troop 48 do? A : We are one of the most active Troops in Garden State Council, with a special emphasis on our outdoor camping program. Each month from September to July our boys get a chance to have some fun and adventure by going on at least one weekend trip, such as canoeing on the Wading River, hiking in Wharton State Forest, backpacking on the Appalachian Trail, Whitewater Rafting the Lehigh River, biking the C&O Canal, sleeping on the beaches at Assateague Island, among many other adventures. We also have a week-long, high adventure trip each summer with adventures for everyone from the brand new Scout to our 17 year olds. In addition to our camping, we have many day events, such as our annual ski trip, Swim Day/Troop BBQ, Rock Climbing Night, and more! The Scouts plan the meeting activities for each month that focus around a Scout skill theme or preparation for an upcoming event. Some popular themes over the years have been First Aid (capped by first aid scenarios where Scouts put their skills to the test), survival and shelter building, knots, cycling, and advancement night. Scouting is about fun, but Scouting is also about helping others. In 2018, we completed just over 1,000 service hours including two Eagle Projects. We have annual commitments to run a rest stop on the MS (Multiple Sclerosis) 150 City-to-Shore Charity Bike Ride, collecting food for the church food drive, and collecting gifts for the less fortunate at the holidays, along with participating in various other service opportunities each year. Q: Do you have programs for the older boys? A: Troop 48 has plenty for older boys, both in the way of leadership and advanced outdoors programs. Seven older boys recently went on a six day backpacking trip in the Olympic Mountains of Washington in the Summer of 2016 as part of a 13 day adventure to Olympic National Park and Seattle. Other highlights include 50 miles on the Appalachian Trail in Northern Virginia and West Virginia in 2017, a two day 55 mile backpacking trip on the Batona Trail in 2016, backpacking the entire state of Maryland on the Appalachian Trail in 2016, a 51 mile backpacking trip in Vermont/Massachusetts in 2014, 51 mile backpacking trip in Shenandoah National Park in 2013, two 50 mile backpacking trips in 2011 (Batona Trail in NJ and the Laurel Highlands Trail in Pennsylvania), a 10 day trip to Philmont National Scout Ranch in New Mexico in 2005, and a long line of 50 mile backpacking trips going back to the troop’s first in 1991. What will out next trip be? The Scouts are planning a 50 mile backpacking trip on the Appalachian Trail in North Jersey for Spring Break 2019. Q: When and where does Troop 48 meet? A : We meet each Wednesday night, 7:00 pm until 8:30 pm, year round, at the shed to the right of the Holy Communion Lutheran Church (442 South Route 73 in Berlin, NJ, directly across from the Wawa gas station). Q: Who is in charge of the Troop? A: Troop 48 has a firm commitment to being of the boys, by the boys, and for the boys. The Scouts elect their own leaders, pick and plan our camping trips, plan each of our weekly meetings, and take care of their own food and meal planning. This fosters personal growth in all Scouts, such as responsibility for others, budgeting, planning ahead, and a spirit of democracy. Q: Does Troop 48 have a summer program? A : Troop 48 differs from many other Boy Scout Troops in our summer program. Going back to our very first summer as an organization in 1965, the troop decided to skip the usual week at a Boy Scout camp. Instead, Scoutmaster Joe Derr took the boys to Lake George for a week to go camping and water skiing. 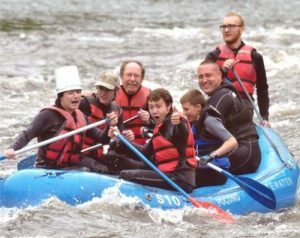 We’ve continued that tradition to this day, as Troop 48 has headed out each summer on a weeklong high-adventure excursion, which Scouts of all skill levels and ages attend and participate in. Past adventures have included Acadia National Park in Maine (2018, 2010), the Catskills of New York (2017, 2012, and 2001), the Berkshire Mountains of Massachusetts (2014), Shenandoah National Park (2013, 2008, and 1993), , Ohiopyle in the Alleghany Mountains of Pennsylvania (2011, 2005, and 2002), Lake Champlain in Vermont (2009, 2003, and 2002) and New York (1969), New River Valley of West Virginia (2007 and 1999), and many more. This has been considered by generation after generation of Troop 48 Scouts to be the highlight of the year. Get any two former Scouts together, and the thousands of “Remember the summer we…” will start up very quickly. Where will 2019 take us? We will be heading back to Shenandoah National Park in Virginia where we last adventured in 2013 for a week of hiking, canoeing, a high ropes course, and swimming! We also have weekly meetings in the summer where boys can work on merit badges with our wide array of over 13 merit badge counselors (we currently cover more than 1/3 of all merit badges). Boys should either sign up for these badges when leaders make announcements, or contact counselors directly with the information posted on this website and in “the shed”. Q: What is your advancement program like? A: Troop 48’s advancement program mirrors our dedication to a boy-led troop. Scouts working on Scout, Tenderfoot, 2nd Class, and 1st Class requirements work on requirements solely with Scouts 1st Class and above, who test the lower ranked Scouts on their skills and sign off their books (other than requirements that specify that an adult must be worked with). For our merit badges, we have 13 merit badge counselors offering nearly 50 merit badges. These are offered either for groups of Scouts or on a one-on-one basis when a Scout requests to work on a merit badge. We also occasionally attend community-run merit badge programs, such as ones run at the Academy of Natural Sciences and other places. Scouts are strongly encouraged to reach out to merit badge counselors across the district if they want to work on a badge that we can’t help them with. Q: What is the religious affiliation of Troop 48? A: Troop 48 has been proudly chartered by Holy Communion Lutheran Church of Berlin, NJ since 1964. However, the troop itself has no specific religious affiliation (and indeed, has very few Lutheran members), and welcomes boys of all faiths. Our members have come from a wide variety of religious backgrounds, including Protestant, Catholic, Jewish, Sikh, Hindu, and other faiths. Q: Do I have to be from Berlin to join this troop? A: Definitely not! Troop 48 pulls from the greater Berlin area, including Berlin Borough, Berlin Township, Voorhees, Pine Hill, Atco, and Gibbsboro with Scouts in the past coming from as far away as Mullica Hill, NJ and Newark, DE (seriously). Q: Can moms go camping with us/become leaders? A: Absolutely. We have a number of moms who camp with us each year, including moms who camp, moms who hike, and moms who whitewater raft. In the past, we’ve even had moms that would backpack and moms who would do multi-day bike trips. We welcome all adults who are willing to take a leadership role in the troop, we can always use the help! We have a large number of female leaders on our Troop Committee, and all who are interested in working more directly with the boys are welcome to talk to the Scoutmaster about becoming Assistant Scoutmasters. Q: What is the purpose of Troop 48? A : Troop 48, Berlin, NJ, Boy Scouts of America exists to provide each Scout that comes through our organization with a quality scouting experience. This Troop provides opportunities for adventure that a young man might not find elsewhere through our extensive monthly outdoor program that includes: camping, canoeing, hiking, backpacking, biking, kayaking, skiing, and similar activities. Through this outdoor program, regular service projects that benefit the larger community, and weekly meetings, Troop 48 teaches young men skills in the areas of camping, first aid, and environmental awareness. In addition, this organization strives to impart our Scouts with certain worthwhile qualities: leadership, teamwork, self-reliance, responsibility, and good citizenship. Each part of the program of Troop 48 is necessary for a quality scouting experience and to move young men toward the organization’s ultimate goal: to forge better men for our future while giving them memories for a lifetime. Have a question not answered here? E-mail Scoutmaster Mike McCormick at michaelmccormick26@gmail.com.